Deadfall is this week's CFBA tour. I thoroughly enjoyed the high-pitched suspense of GERM, so couldn't wait for Deadfall to arrive. The only problem: Eric grabbed it before I could. Now that's a good problem. We both love great fiction, but it means I'm starting it tonight. Good news: That means a review next week. Even better news, Robert is going to stop by with an interview later this week. Stay tuned! 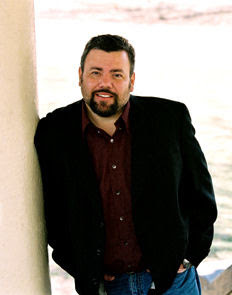 Also, be sure to read to the bottom for some great chances to win autographed books and more from Robert Liparulo. Deadfall: Deep in the isolated Northwest Territories, four friends are on the trip of a lifetime. Dropped by helicopter into the Canadian wilderness, Hutch, Terry, Phil, and David are looking to escape the events of a tumultuous year for two weeks of hunting, fishing, and camping. Armed with only a bow and arrow and the basics for survival, they've chosen a place far from civilization, a retreat from their turbulent lives. But they quickly discover that another group has targeted the remote region and the secluded hamlet of Fiddler Falls for a more menacing purpose: to field test the ultimate weapon. 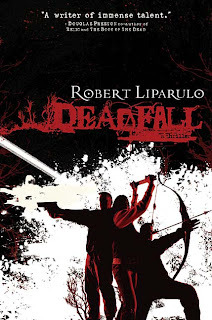 I’d like to give away five signed copies of Deadfall to readers of CFBA blogs during my tour. All they have to do is sign up for my e-mailing list (they won’t be inundated!) by going to his website and going to the “Mailing List” page. Or email him with “CFBA giveaway” in the subject line.